I have been asked many times to explain what Business Process Modeling is, and to explain how it fits with the design of IT systems. This article will set out to give an overview of what Business Process Modeling is all about, and where it fits in an organisation. BPM is not just about IT systems. It is about how a business carries out its processes in the most efficient manner, and how it supports staff to achieve this. It is about designing IT systems to support what people do rather than to have people do what the system tells them to do. Any significant transaction based system development should seriously consider a BPM as the starting point. Many failures in IT projects can be traced back to a mismatch between the physical process and the IT process. These systems create red tape around what was a fairly straight forward process. On the other extreme, if there is no consistent business process, how can you create an IT system to cater for all variations on the process? Is it better to agree one process before you start so IT is aiming at one target rather than many? Why does a Business Process exist? An organisation has a purpose. It may be to build and sell cars – e.g. Ford; it may be to manage health services – e.g. Department of Health; it may be to manage distribution of water or electricity. It may be to sell bread or tin jam. In order to achieve this goal as efficiently as possible, the work is broken down into a number of discreet functions. A function may be Marketing, Billing, Delivery, Human Resources. All functions work together to contribute towards what the organisation exists for. Each of these functions will have its own purpose and responsibilities which contributes to the overall goals. For example, Human Resources will be responsible for recruitment of staff, negotiation with Unions etc. In order to fulfil those responsibilities they create a number of processes, or “way of doing things in a repeatable manner”. There are a number of reasons for making business functions repeatable. The limitations of a business process are both internal and external. 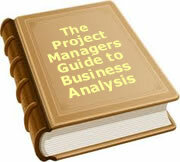 Externally, the processes need to mesh with dozens of other business areas who have their own business processes. As one process changes, it can have a domino effect throughout the business. For example, a change to the format of an invoice which may suit the billing department can cause changes in the information collected from sales, processing payments, customer call centre and even the customer. What is in a Business Process Model? To create a business process model, you need to start by defining what the process is aiming to achieve, and how it fits with other processes. For example, a process to answer billing queries may have the following purpose. It contributes to the higher level goal of collecting money from clients, which in turn has another higher level objective of providing revenue for the organisation. There are a number of ways in which it can be represented. 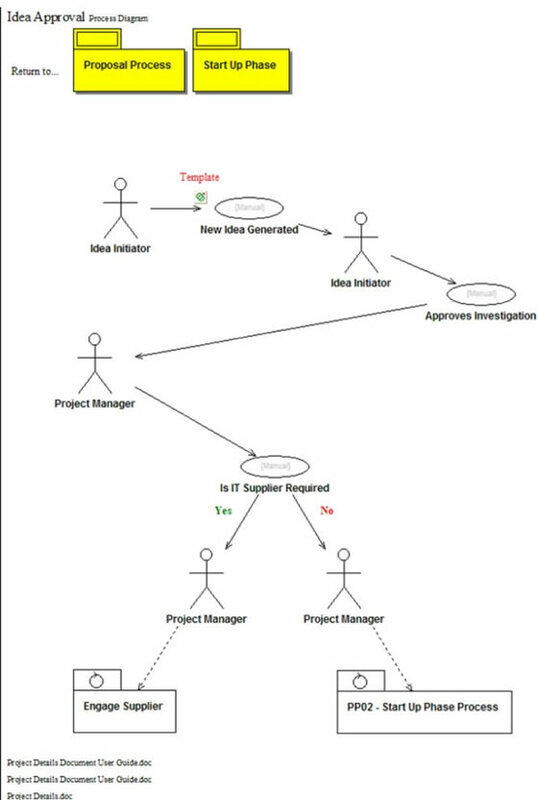 The most basic is a flow chart produced with a tool like Visio or ABC Flowcharter. 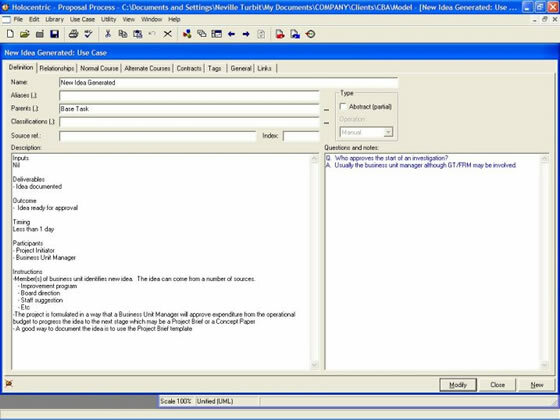 It may be useful for a snapshot of the process but does not allow you to link to things like documents, standards, reports and forms. Nor does it allow you to do things like automatically calculating the time for a complete process by adding up the time for each step or modeling changes to the process. More sophisticated analysis is not possible. A number of tools have been developed to make the process more comprehensive. One such is the Holocentric Modeller (www.holocentric.com) with which the writer has had some experience. I will use this to illustrate some aspects of process modeling It records the process as a series of drill down diagrams. The following is a single page produced for another organisation by the writer using the Holocentric modeller. It relates to the approval of an idea for a new project. - An idea is generated by an individual within the organisation. Initial approval is given by the appropriate business unit to explore the idea. Initial set-up occurs. If a supplier is involved, they are engaged. - Initial business unit approval to explore the idea. - (Optional) Selected IT&T Supplier if external supplier is required. Beside “New Idea Generated” is an icon that if clicked, will display the template to be used. By clicking on the “New Idea Generated” the following screen of information is displayed. To focus on one of the bubbles, it contains the following information. Only one of the tabbed screens is displayed. As can be seen, there is facility to capture all sorts of information including the normal and alternate courses, contacts and relationships to other tasks. Time and resources can also be captured. The BPM is used for the following purposes. Whilst it is not our intention to promote Holocentric in this white paper (although they do have a great tool) by showing their approach, it provides a better understanding of what process modeling is all about. One key feature is that any tool should be simple enough for internal staff to use themselves. Whilst there is some skill in creating the initial model, it should be flexible enough for internal staff to use it to upgrade ever evolving processes. The output should be available in an easy to use format. For example, the Holocentric tool outputs the process as HTML which can be loaded directly onto an intranet. It is all point and click to track through the model, and look at related documents. The following example will indicate the value of a model. The example uses a Call Centre. Is this call in relation to your account? The first option would suit a generalist type of person on the phones. They know something about everything in the company. The screen they have in front of them has fast access to a number of different functions (accounts, deliveries, orders etc.). They would also need a broad responsibility to approve customer requests such as changing accounts, canceling deliveries and changing orders. They need to be surrounded by a library of information which may be on their PC but might also be on files or microfiche. The need access to experts in particular areas. They may need parts manuals and telephone lists. The second option means that they need to be able to enter the customer name and immediately see the customer details such as address, order history, billing history, contact history. This approach may suit a CRM system. The other issue to consider is when the caller will not give a name. It may be a general sales enquiry, or relate to another customer (for example reporting an electrical black out in a particular area). In the particular business, is the customer name always important? There is also the issue of getting a customer to give you their name when they have been on hold for a significant period of time. They just want to tell you their problem. The third option may suit a call centre where most calls are accounts related. You then need to look at the process if it is not accounts. Where to then? If it is accounts, what information do you need? Can you prepare people by having a recorded voice asking them to have their account number ready, or give them options (dial 1 if it is in relation to your last account…). Designing your process has implications on the dialog for the phone, the system design, the skill and authority of staff, and the design of supporting systems. The purpose of business process modeling is to understand what you do now, and what you might want to do in the future. It challenges the way things are done now, and looks at what you need to get the job done. That includes IT systems, information, training, authority and responsibility, interaction with other areas and documentation. In a perfect world, it should be the first step in designing any transaction based system. To date, 37 people have rated this article. The average rating is 3.16 - Add your rating. Just select a rating and click the button. No other information required.